I wouldn't be surprised to hear you say that the NewBlue Video Essentials plugins are not well documented. However, you can find links to the help files in our new " Documentation of NewBlue FX " for each NewBlue Video Essentials effect. This tutorial is intended to familiarize you with the "Drop Shadow" effect included in Video Essentials IV that comes with Studio 19 Ultimate. This "Drop Shadow" effect is applied on an object or character with a transparent background. It can be a video shot on a green background or a cropped image recorded with a transparent background, the png format is one example. Offset sets the distance of the shadow from the object. Angle sets the direction of the shadow from the object. Blur controls the width of the blurring. Color sets the border color. 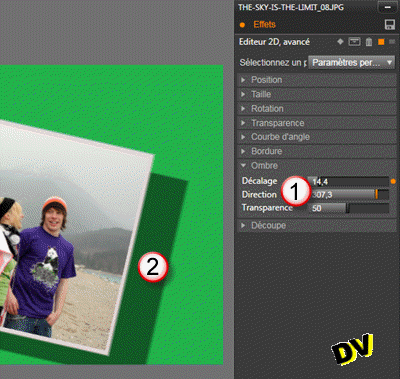 Opacity sets the visibility of the border. This effect supports keyframes. So you can change your settings, if the object is moving, for greater realism. On A/V Track(2) for example, place your background clip. 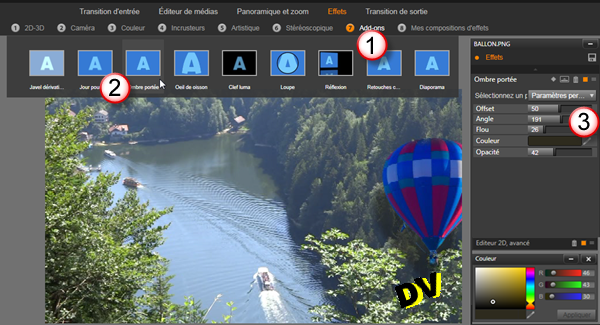 On A/V Track(1), drop the clip with the transparent background using the *.png format. 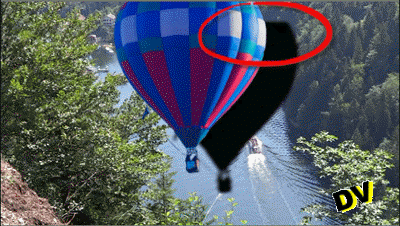 The Video control for A/V Track(2) is disabled so you can see the image of the balloon better. The balloon cutout is visible in the preview window. The black areas are transparent and let you see the clip located on A/V Track(2) when the video control for that track is active again. If you're not able to make a cutout object, you can download the Ballon.png file, in the "Associated File(s)" section at the bottom of this tutorial (right click + Save Target as ... to download the file). Drag the image on A/V Track(1) to adjust its length to that of video on A/V Track(2). 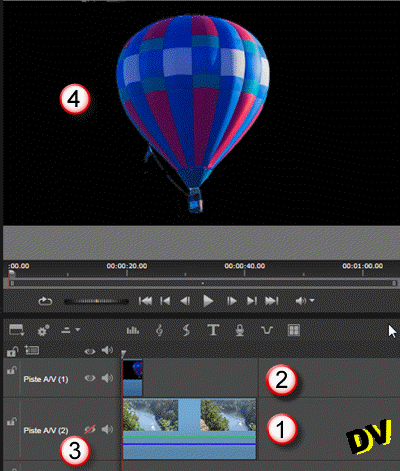 Double-click on the image of the balloon on A/V Track(2) to access the Effects Editor. For starters, you'll animate and position the balloon in its environment. To do this select the 1 2D-3D 2D Editor Advanced Effect. Select the 2D Editor Advanced thumbnail in the ribbon. Click on the "Expand All Settings" icon. You will have a number of parameters to be modified. Create a keyframe at the beginning of the clip with approximate parameters of 44,2,62,62,0,0,25. 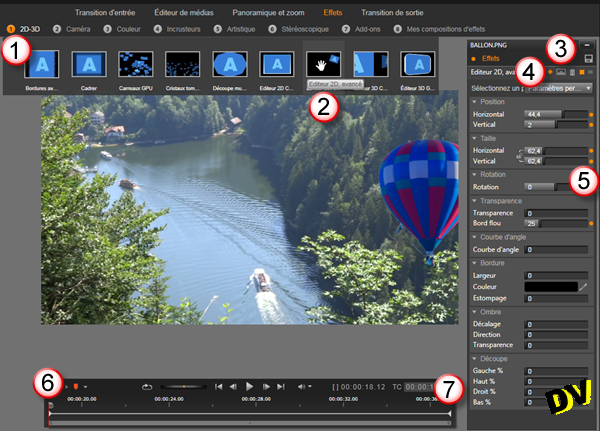 Create a keyframe at the end of the clip with approximate parameters of -31,52,72,72,0,0,25. The shadow would be applied to the edges of the image. Without leaving the Effects Editor, add an additional effect on the A/V Track(1) clip. In Add-ons, select NewBlue Video Essentials IV. In the ribbon, click Drop Shadow. As an example, set offset to 50, angle to 190°, blur to 25, color to gray, and opacity to 42. For the color I chose gray (R=46, G=43 B=30). The plugin does have some limitations. If the object moves off the screen, don't be caught with an offset and angle unsuitable for the situation.